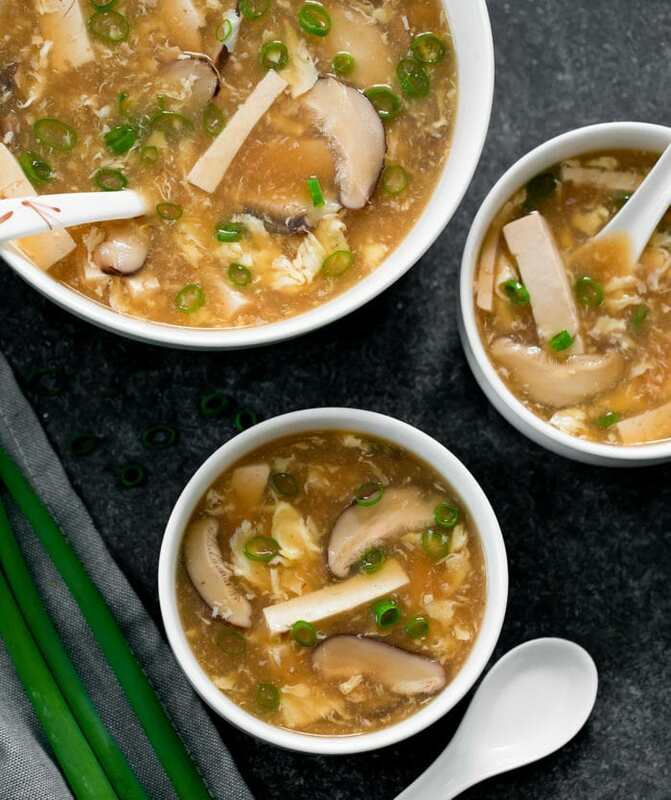 Chinese Hot and Sour soup is easy to make at home, ready in less than 30 minutes, and tastes better than take-out! It’s definitely been soup weather lately and this is one of my favorite hearty and warming soups. 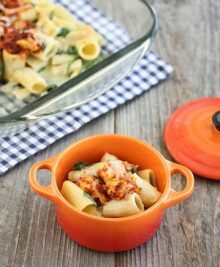 It’s also Chinese New Year today and this is an easy recipe to make to celebrate. 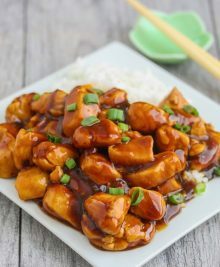 If you’re looking for more recipes to help celebrate, I have a round-up of 35 recipes to make for Chinese New Year. 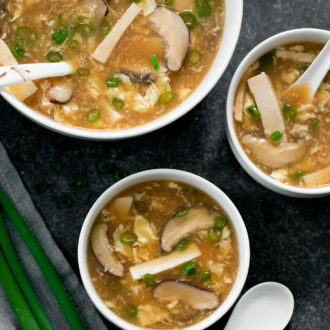 Hot and Sour Soup is so flavorful and fairly healthy. What is especially good about making it at home is that you can customize to your liking. You can make it sourer, spicier, thicker, thinner, etc. 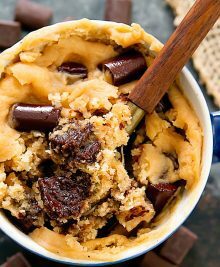 You can also add more of your favorite ingredients or leave out the ones you don’t like. To make the soup, you start with chicken stock. It’s always better if you can make your own but if you’re in a hurry you can buy chicken stock too. I always use ones with no salt added. The sour flavor is achieved through vinegar, preferably rice vinegar. Regular white vinegar has a harsh sour taste. Rice vinegar has a more delicate sour flavor and is also sweeter. The spicy flavor is achieved through chili flakes or chili paste. I use sriracha sauce. The broth is also seasoned with soy sauce, ginger and white pepper. Depending on where you are coming from, the ingredients found inside hot and sour soup can vary. Tofu, shiitake mushrooms and whisked eggs are usual staples. Other common ingredients include wood ear mushrooms, bamboo shoots, pork, and lily buds. For this version, I kept it simple. I added soft tofu, shiitake mushrooms and egg. 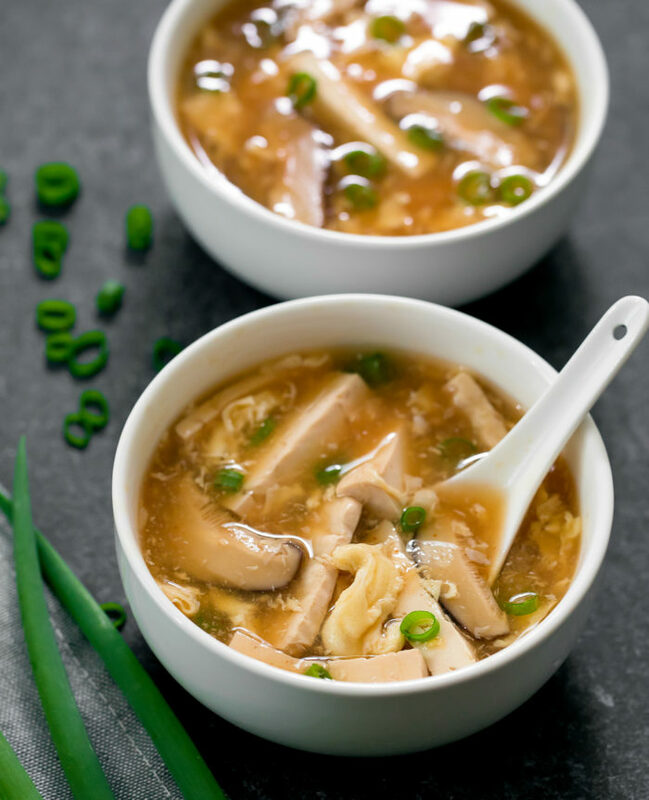 An easy homemade version of Chinese hot and sour soup that tastes as good as the restaurant version. Add broth to a large pot. Mix in rice vinegar, soy sauce, sriracha, ginger and white pepper. Bring to a simmer. Taste and adjust as needed. Gently slide in tofu and mushroom. Cook at a simmer until mushrooms and tofu are cooked. This should only take a few minutes. Taste soup again and adjust seasonings if needed. Turn off heat. In a small bowl, whisk together cornstarch and water until cornstarch is fully dissolved. Pour mixture into soup and mix it right away so that it dissolves into the soup. It is important to stir it right away so that the cornstarch does not clump up. Bring soup to a simmer again and allow it to thicken, 1-2 minutes. While gently stirring the soup, pour the whisked egg in at a steady stream, creating ribbons with the stirring. Turn off heat once the egg is cooked (this only takes a few seconds). Garnish with scallions and serve. Soup is traditionally served with more white pepper, chili oil and black vinegar. Shiitake mushrooms have a strong flavor that some people do not like. If that is the case, you can replace with cremini mushrooms. American Chinese restaurants tend to make the soup extra thick. The traditional Chinese version is not quite as thick. If you like your soup extra thick, you can add 3 tbsp of cornstarch instead of 2 (dissolved in 3 tbsp of water). Cornstarch must always be dissolved in cold water and quickly mixed into the broth before it boils. If you try to mix it in while the soup is boiling, the cornstarch will cook and clump and you will have globs of cornstarch in the soup. Use rice vinegar. Regular white vinegar has a harsh sour taste. Rice vinegar has a more delicate sour flavor and is also sweeter. 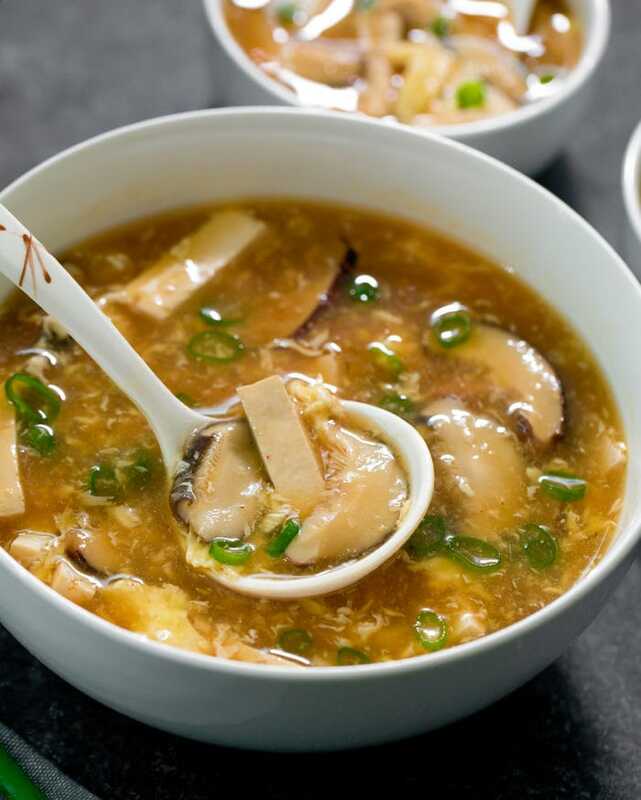 Other ingredients you can add to the soup include wood ear mushrooms, bamboo shoots, pork, and lily buds.